The Not Forgotten Association is a charity providing entertainment and leisure facilities for Service and ex-Service men and women whose lives have been affected by injury during or after Service in the Royal Navy, Army or Royal Air Force. The Not Forgotten Association was founded in 1920 by Miss Marta Cunningham, two years after the Great War ended in November 1918. Born in the United States in 1869 Marta Cunningham was the daughter of Judge Albert Baxter Cunningham and Martha Minerva Tharpe Cunningham. Marta was educated at the high school Convent of Notre Dame in Baltimore, Maryland until 1887. After high school she left America for Europe and trained as a singer at the singing school of Madame Mathilde Marchesi in the Rue Jouffroy, Paris. She also received vocal training in Geneva, Germany and in London. During the First World War Marta was living in London and was keen to help with the war effort. This saw her helping out in canteens and carrying out social work and helping wounded Servicemen. After the war she is said to have made a visit in 1919 to a London hospital. She asked the nursing staff if there might be any Servicemen who were still confined there due to their wounds and she was very surprised to learn that there were several hundred such men at that hospital. Indeed, many thousands of former Servicemen were confined to hospitals across the United Kingdom. Many of them were suffering not only from their physical wounds but were living with feelings of boredom, loneliness, anguish and frustration. Marta was determined to do something about it, and sought to ease their situation by way of providing them with entertainment and recreational activities. In 1920 Marta Cunningham founded the “Not Forgotten” Association. It was her intention to ensure that these men living out of the public view in hospital would know that they were indeed “Not Forgotten”. Marta had connections in Royal circles and invited Her Royal Highness Princess Mary to be the first patron of the Association. Princess Mary was the daughter of the king, King George V and Queen Mary. During and after the war Princess Mary had also been keen to help the war wounded and their families. She had founded the Princess Mary Christmas Gift Fund in 1914, sending gifts to British soldiers on active service at Christmas in December 1914. One of the trips arranged for patients to leave the confines of hospitals and convalescent homes by the “Not Forgotten” Association was an invitation to attend a party at Buckingham Palace, which became an annual event. In March 1923 a short article appeared in the Australian “Queenslander” newspaper about the “Not Forgotten” Association party held in the riding room at Buckingham Palace with the Prince of Wales in attendance. Writing for the newspaper the Social Correspondent from London tells how the disabled and wounded ex-Servicemen “... pelted him [the Prince] with paper balls, enmeshed him in paper ribbons, and frosted him over with confetti ...” (2) Three large cakes had been sent to the party by Princess Mary and, according to the correspondent, the Prince of Wales cut the cakes amid cheers from the men. In 1929 Miss Marta Cunningham was awarded the C.B.E. (Commander of the Most Excellent Order of the British Empire) for her outstanding work for this charity. She died in London in June 1937. 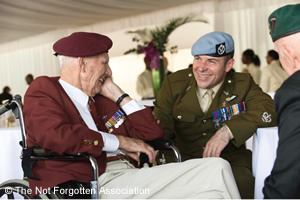 Servicemen and ex-Servicemen spending time together with The Not Forgotten Association. The aims of The Not Forgotten Association, almost 100 years since its foundation, continue to be the provision of leisure and recreation opportunities for Service and ex-Service military personnel from the Royal Navy, Army and Royal Air Force who have been wounded, who have sustained permanent injuries in the line of duty or after leaving the Service. The Association is a registered charity with a small number of staff, most of whom are part-time. The work of the Association is funded by donations and sponsorship raised by individuals and organizations. People raise money for the Association in all sorts of ways; by collecting donations at a special birthday party or at an occasion such as a Summer Ball, being sponsored to run in marathon races, standing with collecting boxes at football matches, donating proceeds from specially organized entertainment and sporting events. Your support, no matter how small a donation, will be gratefully received!